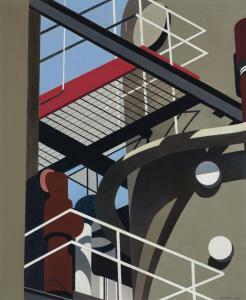 Find artworks, auction results, sale prices and pictures of Charles Sheeler at auctions worldwide. CHARLES SHEELER Architectural Cadences #4. Color screenprint, 1954. 159x222 mm; 6 1/4x8 3/4 inches, full margins. Signed, dated and numbered 43/100 in pencil, lower margin. Printed by Tiber Press, New York. Published by the Art Galleries, University of California, Los Angeles. A very good impression with strong colors. Gordon 6. Charles Sheeler (1883-1965) Tulips-Suspended Forms signed and dated 'Sheeler / 1922' (lower right) tempera and conté crayon on paper 20 x 15 1/2in Executed in 1922. Footnotes Provenance The artist. Dr. and Mrs. William Carlos Williams, Rutherford, New Jersey, gift from the above, 1925. with Salander-O'Reilly Galleries, New York. Katherine and Robert Steinberg, New York, until 1944. Mr. and Mrs. Carl D. Lobell, New York, by 1987. Hirschl & Adler Galleries, New York. Private collection, acquired from the above, 1997. Sale, Christie's, New York, December 4, 2008, lot 13. Acquired by the present owner from the above. Exhibited New York, The Daniel Gallery, Charles Sheeler: Paintings, Drawings, Photographs, 1922. New York, The Museum of Modern Art, Charles Sheeler: Paintings, Drawings, Photographs, 1939, p. 49, no. 53 (as Still Life). New Haven, Connecticut, Yale University, Yale University Art Gallery, Charles Sheeler: American Interiors, April 1-May 31, 1987, no. 8 (as Still Life). 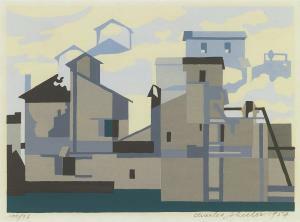 Boston, Massachusetts, Museum of Fine Arts, and elsewhere, Charles Sheeler: Painter-Photographer, October 13, 1987-January 3, 1988, no. 21. New York, Driscoll Babcock Galleries, Suspended Forms: American Modernism 1908-1928, January 31-February 16, 2013. Literature "Paintings and Drawings by Charles Sheeler," American Art News, April 1, 1922, p. 6. T. Craven, "Charles Sheeler," Shadowland, March 1923, vol. VII, pp. 11, 71, no. 1. F. Watson, "Charles Sheeler," The Arts Magazine, May 1923, vol. 3, p. 334, no. 5, illustrated. L.N. Dochterman, The Stylistic Development of the Work of Charles Sheeler, vol. I, Ph.D. dissertation, State University of Iowa, 1963, p. 234, no. 22.086 (as Still Life). S. Fillin-Yeh, Charles Sheeler: American Interiors, New Haven, Connecticut, 1987, pp. 30-31, no. 8, illustrated (as Still Life). C. Troyen, E. Hirshler, Charles Sheeler: Paintings and Drawings, Boston, Massachusetts, 1987, pp. 85-86, 89, no. 21, illustrated. Charles Sheeler is one of the central and most profoundly significant figures in the development of modern art in America. As a painter, draftsman and photographer, he was a defining figure in the development of Precisionism and straight photography. In a career that spanned little more than fifty years, he meticulously created a small but iconic body of approximately four hundred works, destroying all that did not meet his exacting standards. Tulips-Suspended Forms, is one of a small group of six still life works on paper that Sheeler exhibited in his 1922 one person show of paintings, drawings and photographs at The Daniel Gallery, New York. These were executed with tempera paint, conté crayon and graphite. The significance of these works, beyond their aesthetic success, is indicated by the list of original owners and the impressive published critical acclaim they received. 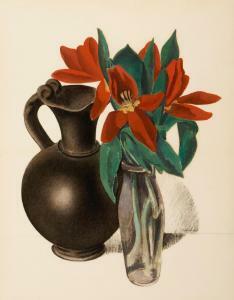 One of the works, Tulips and Etruscan Vase, 1922, was acquired by Abby Aldrich Rockefeller and later gifted to the Museum of Modern Art, New York. Alfred Stieglitz acquired Still Life, Pitcher, 1922, which later became part of the Stieglitz Collection at Fisk University. Tulip, 1922, went to Susan Watts Street and became a 1957 bequest to Williams College Museum of Art, Williamstown, Massachusetts. Suspended Forms (Still Life), 1922, was acquired by Marie Setz Hertslet and later went to The St. Louis Art Museum, Missouri. Sheeler retained Leaves, Flower and Glass, 1922, for his own collection until his death. Sheeler's 1922 Daniel Gallery exhibition was also reviewed by Forbes Watson in The Arts Magazine, where Tulips-Suspended Forms was illustrated. This present work, Tulips-Suspended Forms, is arguably the most lavish and sensuous of the group, having been referenced as, "a lush picture, emphasizing the voluptuous contours of the Etruscan vase and the provocative red petals of the overripe tulips." (C. Troyen, E. Hirshler, Charles Sheeler: Paintings and Drawings, Boston, Massachuetts, 1987, p. 86) In 1925, Sheeler presented the present work as a gift to his friend, the acclaimed poet William Carlos Williams, who owned the work for the rest of his life. Sheeler admired Williams' writing and when they met at a dinner party at Matthew Josephson's home, he shook the poets hand and said "Here is the man I've been looking for all my life." They remained lifelong friends, both went on to brilliant careers and in 1939 Williams wrote the introduction for Sheeler's one person retrospective at the Museum of Modern Art, New York. Sheeler's intent with this body of works was to create "The absolute beauty we are accustomed to associate with objects suspended in a vacuum" (T. Craven, "Charles Sheeler", Shadowland, March 1923, p. 71) which meant he intended to remove all "superfluous ornamentation" to focus interest on the forms and the relationships of forms without anything extraneous. This distillation, this economy of means, was key to his work throughout his career, it is what attracted the attention of important figures like the Arensbergs, John Quinn, Alfred Stieglitz and Marius De Zayas, and probably accounts for the fact that when the great sculptor Constantine Brancusi came for his first American exhibition he "almost lived at the Sheelers'." It is recalled, that when Sheeler placed photographs of ancient Greek sculpture on a mantel and photographed Brancusi standing in front of them, "it was Brancusi who provided the caption, 'Brancusi in front of his background.'" (C. Rourke, Charles Sheeler Artist in the American Tradition, New York, 1938, pp. 98-99) Tulips-Suspended Forms remains one of the iconic still lifes of Charles Sheeler's career and among the most important of these works remaining in private collections. RELATED FORMS II (CONTINUITY #2) Charles Sheeler 1883 - 1965 signed Sheelerand dated 57twice (lower right); signed and dated again and titledRelated Forms II (on the original backing) tempera on board image: 10 1/2 by 8 1/2 inches (26.7 by 21.6 cm) board: 18 by 15 1/2 inches (45.7 by 19.1 cm) Provenance The Downtown Gallery, New York Mrs. Agnes E. Meyer, Washington, D.C., by 1968 By descent to the present owner Exhibited Washington, D.C., National Collection of Fine Arts, Smithsonian Institution; Philadelphia, Pennsylvania, Philadelphia Museum of Art; New York, Whitney Museum of American Art,Charles Sheeler, October 1968-April 1969, no. 164, p. 31, illustrated p. 145 Catalogue Note Related Forms II (Continuity #2)depicts the blast furnaces of the U.S. Steel plant in Pittsburgh, Pennsylvania, which Charles Sheelerphotographed in 1952. 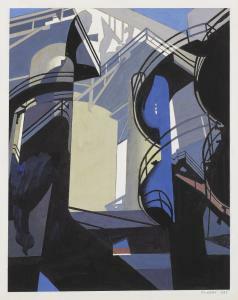 In this series, Sheeler assumed a low vantage point to capture the soaring heights of the furnaces in a similar manner to his earlier depictionsof New York skyscrapers. In the darkroom, Sheeler reversed and superimposed the negatives to construct composite prints, which he later used to create small studies in tempera and larger oils. The subject of Related Forms II (Continuity #2)relates closely to Ore into Iron, his first work from the series, which is in the collection of the Museum of Fine Arts, Boston. This work once belonged toAgnes Ernst Meyer, the noted journalist, literary translator, author, and activist.Meyer was a passionate collector and a dedicated advocate of the arts. She was a staunch supporter of Alfred Stieglitz's 291 Gallery, a major donor to the National Gallery of Art, and a founding member of the Freer Gallery in Washington, D.C.
Charles Sheeler (1883-1965) Cat-walk signed and dated 'Sheeler-1947' (lower right)--signed and dated again (on the stretcher) oil on canvas 24 x 20 in. (61 x 50.8 cm.) Painted in 1947. Provenance The Downtown Gallery, New York. Mr. and Mrs. Charles A. Bauer, acquired from the above, 1947. [With]James Maroney, Inc., New York. Acquired by the late owner from the above, 1978. CHARLES SHEELER Architectural Cadences #4. Color screenprint, 1954. 159x222 mm; 6 1/4x8 3/4 inches, full margins. Signed, dated and numbered 100/51 in pencil, lower margin. Printed by Tiber Press, New York. Published by the Art Galleries, University of California, Los Angeles. A very good impression. Gordon 6.